Bonus Key Qualifying Criteria: New online customers only, 21+, USA Only. Always Wager Responsibly - National Gambling Helpline: 1-800-522-4700. The Double Your First Deposit Fall (“Promotion”) is only open to new TVG account holders in TVG Participating States, age 21+, 4NJBets account holders who are residents of New Jersey, age 18+ and PABets account holders who are legal residents of Pennsylvania, age 21+. Void where prohibited by law. To qualify for the Promotion, sign up for a new TVG account using promo code FALL (“Promo Code”) between 9/22/18 and 12/20/18 (“Sign-Up Period”), and within 15 days of signing up, make an initial deposit into your TVG (or 4NJBets or PABets) account and you will receive a bonus equal to the lesser of (i) the amount of your first deposit, or (ii) $100 (“Bonus”). New accounts only. See full Terms and Conditions for details. Originally launching as a satellite sports channel dedicated to horse and greyhound racing, TVG (the Television Games Network) is now another online betting service for those sports operating legally for U.S. customers. The company is part of the FanDuel group, which itself is the U.S. division of one of Europe’s largest betting companies, the mighty Paddy Power Betfair. TVG therefore certainly comes with a fine pedigree for off-track betting – Paddy Power being a traditional Irish bookmaker that grew its business with staggering success in the online space – and the license to offer U.S. residents its service, but is that enough to get you to sign up? Let’s take a look. Bonus Key Qualifying Criteria: New online customers only, 21+, USA Only. Always Wager Responsibly – National Gambling Helpline: 1-800-522-4700. The Double Your First Deposit Fall (“Promotion”) is only open to new TVG account holders in TVG Participating States, age 21+, 4NJBets account holders who are residents of New Jersey, age 18+ and PABets account holders who are legal residents of Pennsylvania, age 21+. Void where prohibited by law. To qualify for the Promotion, sign up for a new TVG account using promo code FALL (“Promo Code”) between 9/22/18 and 12/20/18 (“Sign-Up Period”), and within 15 days of signing up, make an initial deposit into your TVG (or 4NJBets or PABets) account and you will receive a bonus equal to the lesser of (i) the amount of your first deposit, or (ii) $100 (“Bonus”). New accounts only. See full Terms and Conditions for details. TVG focuses on horse racing. TVG provides a comprehensive stats service horse racing. See TVG site for details on TVG In-play Betting. The main TVG site offers a clean if rather functional presentation, that didn’t set our pulse racing initially. However, whilst it’s not an especially elegant bit of web design it still is perfectly serviceable when it comes to enjoying some deep immersion in the pursuit of our favorite betting entertainment. Once registered with a player account – a process that is smooth and quick if you’re legally eligible to use the service, and which entitles you a decent welcome bonus – you’ll find TVG gives you easily navigable access to watch and bet on live horse racing events from over one hundred and fifty tracks around the world. The service includes live odds, handicapping picks, tips and results to compete with its rivals, and so you’ll find pretty much all you need to enjoy easy off-track betting from the comfort of your favorite digital device. Mention of favorite digital devices above, leads us neatly to cover the mobile potential of TVG. As we’ve come to expect from the best online betting services, a mobile iteration of TVG’s website delivers a very smooth and comprehensive experience that won’t leave you feeling like you’re missing out on anything. 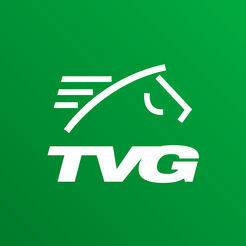 For even more seamless integration, iOS users can take advantage of TVG’s free native app from the App Store. It seems Android users are yet to get a native app but, as we’ve noted already, since TVG’s mobile site isn’t crippled in any way when compared to the desktop site this isn’t a significant issue that should turn you off if you’re not an Apple fan. TVG offers an iOS app and an Android app but it’s just as easy to play on your Smartphone’s browser. You can watch your favourite sports live on iPhone, iPad & Android. TVG offers excellent 24/7 support, 7 days a week. TVG uses Email, Phone and Snail Mail. TVG should certainly be a front-runner if you’re looking to find a legal U.S. betting service for horse racing. Whilst its website isn’t necessarily beautiful to look at, the service it clothes is very attractive indeed. As a route to watching of the best horse racing in the world, with really comprehensive betting facilities at your fingertips we think you’ll find TVG has plenty of form.